Citation: Nkwonta OI, Dzwairo B, Otieno FAO, et al. Technical Adaptation Options for Current Reservoir Operating Rule Curves for Inanda Reservoir. ChemXpress. 2016;9(5):103. The effective management of water resources is of great importance as it ensures the supply of water resources that may support changing water requirements over a selected planning horizon, in a sustainable and cost-effective way. Essentially, the purpose of the water resources planning process is to balance the available water resources in a system with the water requirements and losses to which the system is subjected. This paper covers a review of generic planning processes and procedures as these apply to complex hydrological systems. Its aim was to improve the balance between water supply and projected requirements which could consists of water demand management options and/or infrastructure developments. It was concluded that application of reservoir planning is of great importance, in the fact that the planning processes and procedures described in the manuscript are generic, as it would be impossible to deal with all the intricacies of complex water resources systems. Thus it is concluded that Water Resources Yield Model has an advantage over other models by managing model runs, developing a representative system network, modeling incremental sub-catchments, creating a variety of standard system features, special modeling features, and run result output options. Raw water in South Africa is considered a strategic national resource, with the responsibility for its management taking place at three tiers. These are firstly Central Government, secondly Provincial and Regional Governments, including other specified authorities, and thirdly Local Authorities. The way in which the value of water resources is perceived should reflect societal values, ethics and the specific characteristics of this complex resource. The ecological integrity, which gives a water resource its resilience, is an essential component of the value of the resource. South Africa manages its water resources using the 22 primary hydrological basins (Figure 1). The numbers in Figure 1 shows the basins in South Africa. 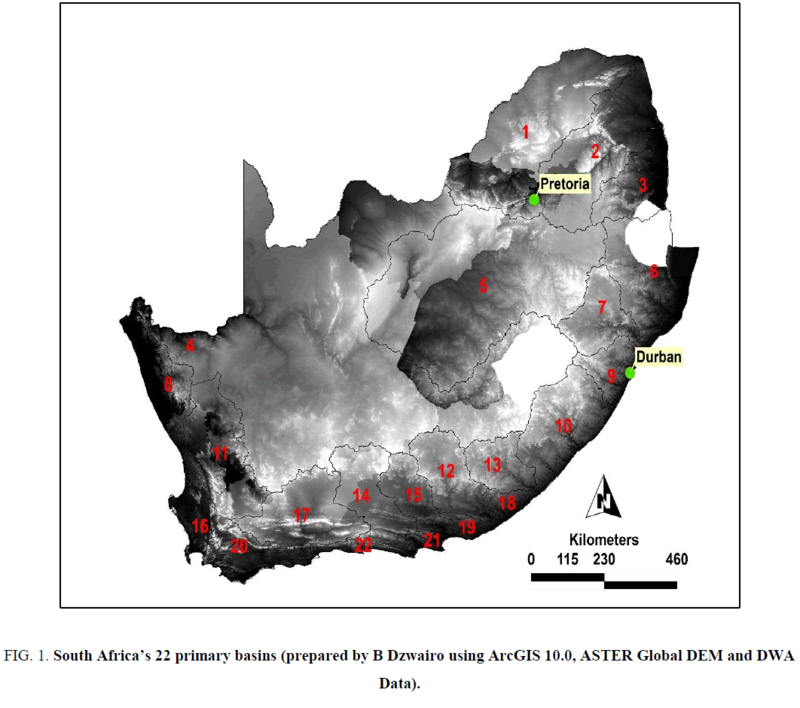 Figure 1: South Africa’s 22 primary basins (prepared by B Dzwairo using ArcGIS 10.0, ASTER Global DEM and DWA Data). Administratively and economically, the raw water resource is managed as 19 water management areas (Figure 2). Figure 2: South Africa’s 19 water management areas (prepared by B Dzwairo using ArcGIS 10.0, ASTER Global DEM and DWA Data). Water management areas (WMAs) and the hydrological basins boundaries do not coincide in many places (Figure 3). It is important to note that the aforementioned administrative WMA system is unique to South Africa and that the country has a complex water transfer organizational structure and schemes. These support commercial and industrial growth in line with the new Constitution (Act No. 108 1996) and the new Water Act (Act No. 36 of 1998). 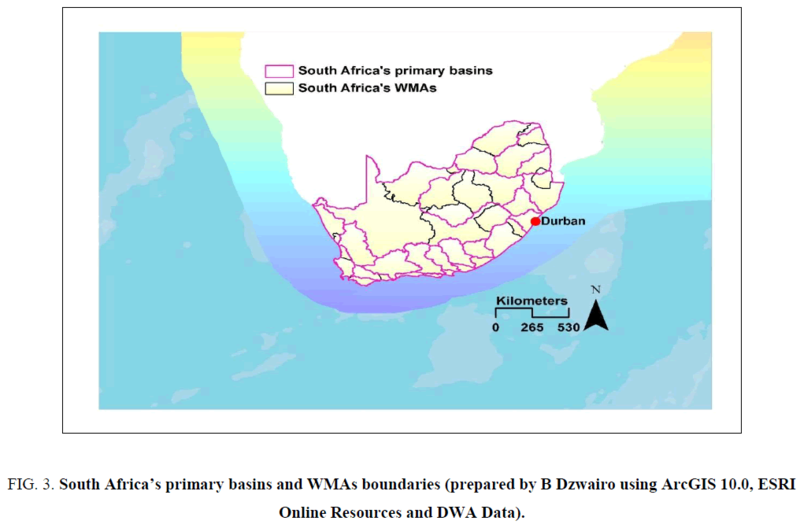 Figure 3: South Africa’s primary basins and WMAs boundaries (prepared by B Dzwairo using ArcGIS 10.0, ESRI Online Resources and DWA Data). For South Africa as a developing country that is in transition, the need for economic development is urgent and many people depend on natural resources and agriculture to sustain their livelihoods. The necessity of assessing major implications of dams is needed, given the complexity of water resources systems . Oliveira and Loucks  stated that defining effective operating rules for a particular water supply system is a challenging decision, especially those that apply to multiple reservoirs, which serve multiple purposes and objectives. While pointing out that, optimization models are playing a very important but still very minor role in identifying possible real-time reservoir operating rules. More research towards robust models is necessary. In river basin studies, reservoir systems have their unique aspects and a variety of mechanisms are used in defining their operating rules. Most of the water resources optimization problems involve conflicting objectives . Reservoirs can increase the reliability of water supplies in promoting livelihoods, raising agricultural productivity, and reducing the farmers’ vulnerability to droughts. The frequency and intensity of extreme hydrological events varies highly in South Africa , which obviously restricts the effective use of water and causes insufficient water supply. To overcome the problem of insufficient water supply during periods of low flow, attention has been focused on improving water resources management, especially in optimization of reservoir operations [3,5]. The majority of research in water resources is devoted to developing ways to meet human water demands, while the explicit inclusion of environmental flow targets has received less attention. Lately, engineers often face criticisms regarding water resources management due to the lack of careful assessments of environmental impacts caused by reservoir operations. In an attempt to minimize these negative impacts, the related environmental aspects must be taken into account in the management of water storage facilities [6-8]. In the last decades, the minimum environmental flow target gained the attention of scientists, engineers, and managers [9-12]. The target was designed to maintain the minimum stream flows for sustaining aquatic ecosystem. It provided a single value that could be easily implemented as another objective to be optimized in water management programs. The implementation of a single flow, however, was found to eliminate the flow variability sustaining healthy and diverse aquatic communities. Lately, there has been a great deal of effort devoted to estimating environmental flow requirements and to the identification of the need for maintaining ecological flows to protect freshwater biodiversity [13-15]. The importance of mimicking components of the natural flow regime as targets for managing flow magnitude, frequency, and timing variables is now better understood [13,15]. The flow regime, however, contains too many variables, which makes it very difficult to implement in water resources management. Moreover, translating general hydrologic-ecological principles and knowledge into specific management rules for particular river basins and reaches has remained a daunting challenge. Harman  mentioned that only a few published studies explicitly described the link between environmental flow targets and dam operating rules. To resolve the river management-driven issues and bridge the gap between a simple minimum stream flow target and the great complexity of the natural flow regime, the research proposed a realistic and feasible approach that incorporates the human demands with the most essential aspects of natural flow variability (such as the seasonal base flow requirements) as the key targets in searching for the optimal strategy of reservoir operation management. The effective management of water resources is of great importance to ensure the supply of water resources to support changing water requirements over a selected planning horizon and in a sustainable and cost-effective way. Essentially, the purpose of the water resources planning process is to balance the available water resources in a system with the water requirements and losses to which the system is subjected. The process involves a number of aspects, and these are briefly discussed below. The first aspect involves the assessment of the water resource capability of the system in question, the associated assurance of supply, current and projected water requirements, user priorities and acceptable risks of non-supply, as well as various water quality criteria. The second considers the way in which a system is operated since this directly influences its resource capability and includes aspects such as detailed operating rules for reservoirs and inter-basin transfer schemes, the prioritization of water sources and supplies, special operating rules associated with the blending of water for the purpose of meeting special water quality criteria, operational cost savings and system maintenance schedules. The third aspect involves the scheduling of interventions that may be required in to ensure that the future balance of water resources and water requirements in a system are maintained. Such interventions may involve, on the one hand, increasing the available resources through infrastructure development and, on the other, lowering requirements through water conservation and demand management (WCDM) initiatives, water reuse, the reallocation of resources to high priority users and catchment management. Finally, an important aspect of the water resources planning process requires the careful monitoring of the various components of the system in order to evaluate the accuracy of predictions and the degree to which implemented measures have succeeded. The problem of allocating a resource such as water stored in a reservoir system is a complex task, especially due to the stochastic nature of inflows into the system. As water supply systems build up in complexity, from run-of-the river systems to single reservoirs then to multiple storages, the number of alternative ways of operating the system increases and the operation approach becomes less applicable. The operation of most multiple reservoir systems reflects the fact that there are sometimes conflicting and sometimes complementary multiple purposes served by the water stored in and released from reservoirs. For a complex system with a large number of reservoirs and aqueducts, attempts to determine best operating policies by search i.e., trial and error, with a simulation model made to run on digital computers have been found to require an inordinate amount of computing time. Therefore, the decision makers need tools to operate their reservoir systems in an optimum, or rather, in the best manner. During the past two decades, one of the most important advances made in the field of water resources engineering is the development and adoption of system analysis application methods for planning, design and management of complex water resource systems. The rapid evolution of computers together with their frequent use in management and control also contributed to the growth of system analysis applications in the field. System analysis cannot be defined with a single phrase as it involves several disciplines and a large number of actions. Stalnaker  defines system analysis in brief as follows: "System analysis is a coordinated set of procedures that can be used to address issues of project planning, engineering design, and management. System analysis is a decision making tool. An engineer can use it for determining how resources can be used most effectively to achieve a specified goal or objective. For successful decision making, both technological and economic considerations must be employed in the analysis." • Models are inherently a simplification of the real world. • The reliability of the results is largely data-dependent. • It is often difficult to select an appropriate model or to standardize on a specific modeling approach. • The modeling software generally requires expert configuration and interpretation, extensive checking and testing and is applied by relatively small user groups. The Water Resources System Model (WRSM) was developed for the purpose of modeling complex water resource systems and is used together with other simulation models, pre-processors and utilities for the integrated management of water resources . Essentially, the model provides as a decision support system with the ability to evaluate the capability of existing and proposed water resource systems through simulation of the physical, statistical, operational and water quality aspects that influence the capability of such systems. The structure of the WRSM was designed with the purpose of maintaining versatility and general applicability. The major strength of the model therefore lies in the fact that it enables the user to configure most water resource system networks using basic building blocks, which means that the configuration of a system network and the relationships between its elements are defined by means of input data, rather than by fixed algorithms embedded in the complex source code of the model. Once the WRSM has been configured for a particular water resource system, the model may be used for undertaking two distinct analysis types depending on the purpose of the study in question. These are yield analyses and planning analyses and more information in this regard is provided below. The purpose of a yield analysis is to assess the total long- and short-term resource capability or yield at a particular point in a water resource system at a fixed selected development level and set of system operating rules. The yield of a system can be determined based either on a historical yield analysis, in which case the yield is typically expressed as a historical firm yield, or based on a stochastic yield analysis, in which case assurance of supply (or risk of non-supply) may be determined for a variety of yields. In general, the purpose of undertaking planning analyses is to analytically quantify the capability of dynamic changing water resource systems, determine operating rules and schedule the implementation of development options using network simulation procedures and practical allocation strategy. This involves determining the ability of a water resource system to satisfy water requirements which are distributed geographically and change with time. The water requirements consist of two components, volumetric and reliability of supply requirements, while two additional variables are also considered for modeling, water quality in the form of total dissolved solids (TDS) and sulphates, as well as hydropower generation capabilities. The curtailment strategy is a procedure that was developed to restrict water use during periods of drought in order to protect the resources of high priority users. The implementation of restrictions is a fundamental management principal embedded in the operating rules of the major water resource systems in South Africa . Over time, changes may also occur in the water resources system itself, with reservoirs and transfer conduits that may be activated or deactivated to mimic the commissioning or decommission of water resource infrastructure. The impoundment and delivery dates of planned reservoirs, as well as the delivery pattern over time represent the implementation requirement of development options. This schedule of dates is determined with the objective to postpone any implementation as far as possible without exceeding the acceptable risk of curtailments as dictated by predefined criteria. Furthermore, within the framework of optimal long-term inter-reservoir and inter-sub-system operating rules are simulated by the model with the objective of achieving a balanced utilization of inter-dependent water resources. Operating rules may also include water quality-related rules, i.e., by imposing TDS concentration limits, which are achieved through blending and/or dilution. In order to elaborate on the purpose of the model the processes of development planning and operational planning are described below. Development planning refers to the process carried out to determine the need and timing of interventions in a water resource system. Intervention in this context refers to any measure that could be implemented to improve the balance between water supply and projected requirements which could consists of water demand management options and/or infrastructure developments. Continuous and increasing deficits in supply may require long-term measures that would probability consists of a series of options to be implemented, while short-term deficit problems, that disappear over time, due to for example increased return flows, require the implementation of interim measures only. Finally, an implementation schedule of proposed intervention measures may be developed. In general, the measures with the lowest unit costs will be implemented first to postpone the more expensive solutions. The model links all water resource systems which are dependent on one another, implements the selected allocation strategy, accounts for growing water requirements, introduces chances to the physical system at specific points in time and simulates salinity dilution or blending rules if required. Analyzing the system in this way ensures all relevant aspects are considered in and integrated manner and the results, therefore, reflect the interdependency of all relevant aspects . • Inter-reservoir operating rule optimization within sub-systems. • Water quality blending operating rules. • Annual operating analyses to determine short-term operating rules taking into consideration reservoir levels at a given point in time. • Combined operation of water resource systems with hydropower and water supply as competing users. • Assessments are usually based on scenarios analyses where the objectives are to: Maximize yield or extend the requirement of further intervention as for into the future as possible. • Reduce operating costs (pumping energy) during periods of full system storage levels by deviating from the long-term operating rule. This can only be considered if the long-term reliability of supply in not jeopardized. • Optimize the system operation with respect to water quality (salinity) criteria. A balance between water quality and supply reliability has to be achieved. • Maximizing hydropower generation without jeopardizing the reliability of water supply, or vice versa. • The Water Resources Yield Model (WRYM) which is used for undertaking yield analyses. • The Water Resources Planning Model (WRPM) which is used for undertaking planning analyses. Concentration of total dissolved solids (TDS) and sulphates in the water resource system . Also, the Water Resources Information Management System (WRIMS) was recently developed to improve the performance and ease of use of the model by providing a database to manage WRSM data sets, as well as an interface which allows for system configuration and run result interpretation within a Microsoft Windows environment. • The development of detailed requirement specifications. • Software development and testing. • An assessment of the historical developments inside the catchment area under consideration and the impact of those developments of stream flow. These may include the water use and return flows related to urban and industrial areas, irrigation, stream flow reductions (SFRs) and mining, as well as the impacts of physical catchment features, such as water bodies, transfer schemes, stream flow diversions and wetlands. • The hydro-meteorological data analysis, including the selection, collation, assessment, and correction of historical rainfall, evaporation and stream flow data. • Modeling of the dynamic relationship between rainfall and runoff. A summary is provided below of the application of hydro-meteorological data in the WRSM. • Impact of rainfall on catchment developments, such as irrigation water requirements and return flows from large urban areas. • Rainfall directly on the surface area of water bodies in the catchment, including major dams, small dams, weirs, gravel pits, wetlands and the pollution control dams (PCDs) used in coal mining activities. • Evaporative losses (through evapo-transpiration and other mechanisms) from catchment developments and physical catchment features such as irrigated crops, wetlands and coal mining activities. • Losses through evaporation directly from the surface area of impoundments in the catchment, including major dams, small dams, weirs, gravel pits, wetlands and PCDs. • Determining the historical sequence of monthly inflows to reservoirs and other nodal points within the water resources system under consideration and thereby allow for the behavior of the system to be simulated. • The stochastic hydrology analysis and subsequent generation of stochastic (or synthetic) stream flow sequences for application in stochastic yield and planning analyses. In order to achieve the appropriate modeling resolution in the WRSM, the study area is generally divided into a number of smaller sub-catchments. This subdivision is based, firstly, on the topography of the study area and, secondly, on its physical layout, including aspects such as the locality of the main and tributary river catchments, flow gauging stations, water use and return flow centers and water bodies. The exact boundaries of defined sub-catchment can be determined in various ways, including the manual analysis of contour lines on 1:50,000 topographical maps or by using digital terrain models (DTMs) and geographical information systems (GIS). The defined incremental sub-catchments ultimately form the basic structure of the representative system network model and determine, most importantly, the location within the water resources system at which hydrology inflows to reservoirs and other nodal points occur. The name of each incremental sub-catchment in the system is defined in the statistical parameter file, PARAM.DAT. For example, if an analysis of the Umgeni River system is being undertaken, incremental sub-catchments may be defined for the Midmar, Albert Falls, Nagle and Inanda Dam catchments, in which case the corresponding catchment names in the PARAM.DAT-file may be MID, ALB, NAG and INA. Furthermore, the total catchment area each incremental sub-catchment in the system (in units of km2) is also defined in the PARAM.DAT-file. This variable is used internally by the model for the purpose of calculating natural runoffs from the natural portion of each sub-catchment after having accounted for the combined extent of areas under irrigation, stream flow reduction catchment portion areas and coal mining activities. A second principle is applied in order to provide a link between the state of storage in the first and second months. The principle states that the storage in the reservoir at the beginning of any month must be equal to the storage in the reservoir at the end of the preceding month. This is shown below. By applying this principle, the start storage for the second month is determined. Similarly, by applying both these principle, in turn, to every month in the simulation period, the storage in the reservoir may be determined at any point in time. • Projected annual system water curtailments are plotted using the LTPLT.EXE and WRPBOX.EXE post-processing utilities based on planning analysis results from the *SYS.OUT-file. • Projected annual system water requirements vs. supplies are also plotted using LTPLT.EXE and WRPBOX.EXE from the *RES.OUT-file. • Projected annual system storage volumes are also plotted using LTPLT.EXE and WRPBOX.EXE from the *SYS.OUT-file. • Projected reservoir storage volumes are plotted using WPLT_10.EXE and WRPBOX.EXE from the *PLT.OUT-file, as well as a special “CONTROL”-file detailing the location of individual *PLT.OUT-files containing information from separate sequence run sets. • Projected channel flows are plotted using PMP_10.EXE and WRPBOX.EXE from the *PMP.OUT-file, as well as a “CONTROL”-file detailing the location of individual *PMP.OUT-files containing information from separate sequence run sets. • Projected inter-sub-system support volumes are plotted using LTPLT.EXE and WRPBOX.EXE from the RES.OUTfile. Examples of the plotted graphs are shown in Figure 4, 5, and 6. 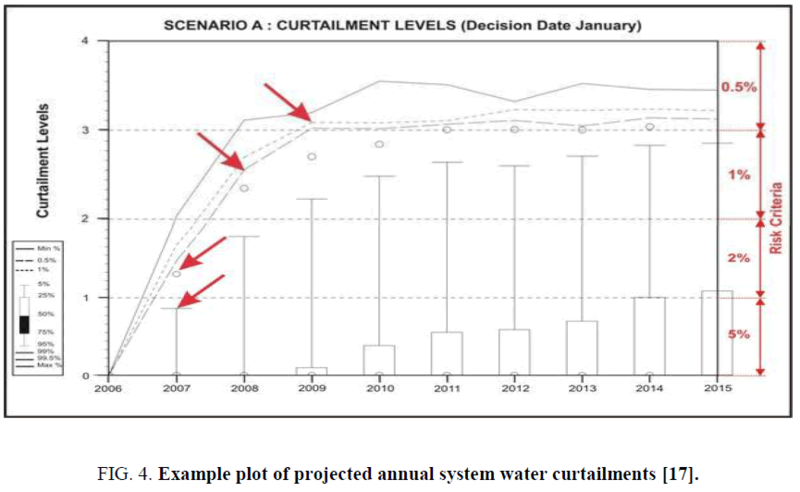 Figure 4: Example plot of projected annual system water curtailments . 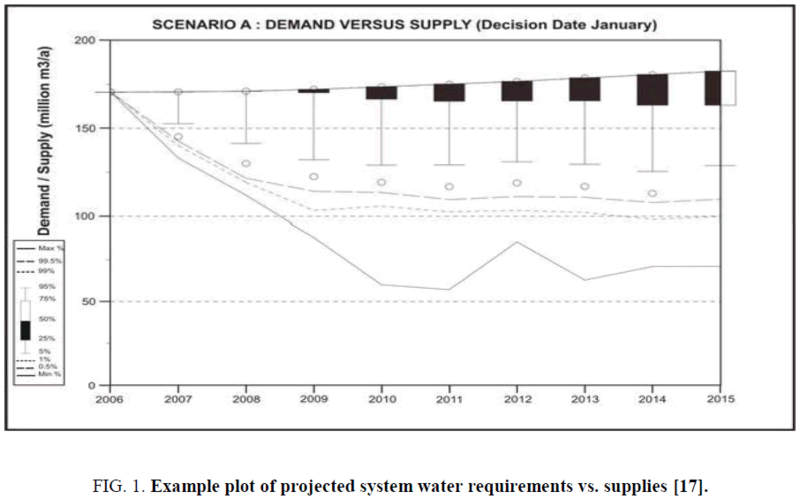 Figure 5: Example plot of projected system water requirements vs. supplies . 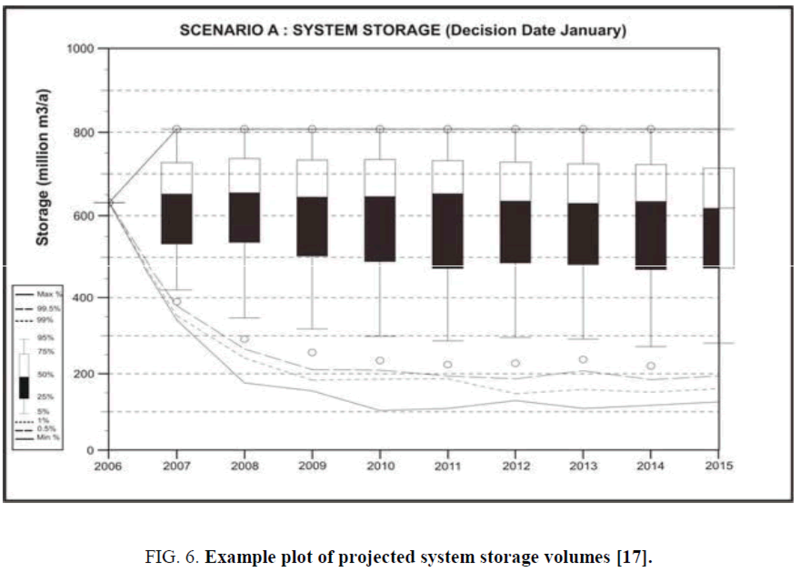 Figure 6: Example plot of projected system storage volumes . As shown in Figure 4, 5, and 6, the storage system stores the spills from storages if capacity permits, while in the real system, some of these spills cannot be stored. Similarly, the evaporation losses cannot be explicitly modeled because of the relationship between surface area and storage volume cannot be satisfactorily defined for the lumped storage to simulate the evaporation losses of individual storages. They are lost as wastage or unused water in the real system. The wastage or unused water comprises of water that cannot be used by demand zones and courted from the bottom ends of the catchments. Furthermore, the capacity constraints of carriers are not considered in the system. This is particularly important in some cases when the restricted demand cannot be supplied because of the problem in the carriers (such as capacity is insufficient), causing drought in some reservoirs. Shortfalls also could occur due to non-availability of water resources at certain reservoirs. If these effects are ignored in the derivation of restriction rules, the analysis has provided an erroneous solution. Various researchers have developed computer-based DSSs for the management and operation of reservoirs and river systems. Russell  reported that these focused primarily on the physical aspects of the system. They are frequently based on simple engineering principles for dam operation, such as keeping reservoirs full for water supply or empty for flood control. Currently, the vast majority of reservoir system planning and operation is undertaken using simulation and optimization models. As such, they provide a great deal of flexibility in the specification of system operations under various flow, storage and demand conditions. Many rules are based on largely empirical or experimental success, determined either from actual operational performance, performance in simulation studies or optimization results. These experimentally-supported rules are common for large multi-purpose projects. Both simulation and optimization techniques require that the management ‘problem’, whether it be a long-term planning or an operational issue, is formulated explicitly in a mathematical algorithm. While many issues related to dam planning and operation can be expressed in this way, and so are termed “well structured”, many others cannot. So called ‘semi-structured’ or ‘unstructured’ problems occur when there is a lack of data or knowledge, non-quantifiable variables or very complex, perhaps unknowable, interactions. For dams, a lack of understanding of the complexity of environmental impacts, and also of the links between biophysical changes and socioeconomic impacts, means that many management problems are, at best, only semi-structured. To add to the difficulties, different stakeholders with different values will often perceive reality problems in different ways. In some cases, they will not even agree on the issue, so that problem formulation can be more a social process than a technical one. In such situations, Water resources yield model can be used to solve those difficulties. It has an advantage over other models by managing model runs, developing a representative system network, modeling incremental sub-catchments, creating a variety of standard system features, special modeling features, run result output options etc. Wurbs RA. Reservoir-system simulation and optimization models. JWater Resour Plann Manage. 1993;119:455-72. Oliveira R, Loucks DP. Operating rules for multi reservoir systems. Water ResourRes. 1997;33(4):839-52. Chang LC, Chang FJ. Intelligent control for modeling of real-time reservoir operation. HydrolProcess. 2001;19(11):2277-89. Ndiritu JG. Reservoir system optimization using a penalty approach and a multi-population genetic algorithm. Water SA. 2003;29(3):273-9. Chen L, Chang FJ. Applying a real-coded multi-population genetic algorithm to multi-reservoir operation. HydrolProcess. 2007;21(5):688-98. Gibbins CN, Soulsby C, Jeffries MJ, et al. Developing ecologically acceptable river flow regimes: a case study of Kielder reservoir and the Kielder water transfer system. Fisheries ManagEcol. 2001;8(6):463-85. McCartney MP, Awulachew SB, Seleshi Y, et al. Decision support systems for dam planning and operation in Africa. Working Paper 119, International Water Management Institute, Colombo, Sri Lanka; 2005. Bauer M, Olsson O. Integration of enhanced reservoir operation (enrop) into IWRM in association with environmental and ecological aspects. XIIIth World Water Congress, 2008 Sep; Montpellier, France. Stalnaker CB, Arnette JL. Methodologies for the Determination of Stream Resource Flow Requirements. An Assessment. 1976. Tennant DL. In stream flow regimens for fish, wildlife, recreation and related environmental resources. Fisheries. 1976;1(4):6-10. Pusey BJ.Methodsaddressing the flow requirements of fish. In: ArthingtonAH, ZaluckiJM, editors. Comparative Evaluation of Environmental Flow Assessment Techniques: Review of Methods. Occasional Paper 27/98. Canberra: Land and Water Resources Research and Development Corporation; 1998. p. 66-105. AdeyemoJA, OtienoFAO. Optimising reservoir operation for maximum irrigation benefit. Proceedings of the Australia's National Water Conference and Exhibition. 2009 Mar 16-18; Melbourne, Australia. Richter BD, Baumgartner JV, Powell J, et al. A method for assessing hydrologic alteration within ecosystems.Conservation Biology. 1996;10(4):1163-74. PoffNL, AllanJD, BainMB, KarrJR, PrestegaardKL, RichterB, et al. The natural flow regime: a paradigm for river conservation and restoration. Bioscience. 1997;47(11):769-84. PoffNL, AllanJD, PalmerMA, HartDD, RichterBD, ArthingtonAH, et al. River flows and water wars: emerging science for environmental decision making. FrontEcolEnviron. 2003;1(6):298-306. Harman C, Stewardson M. Optimizing dam release rules to meet environmental flow targets. River ResApplic. 2005;21(2-3):113-29. DWAF. Hydrological records for river gauging station U2H054. Department of Water Affairs and forestry, Pretoria, South Africa. 2009. Russell SO, Campbell PF. Reservoir operating rules with fuzzy programming. JWater ResourPlannManage. 1996;122(3):165-70.